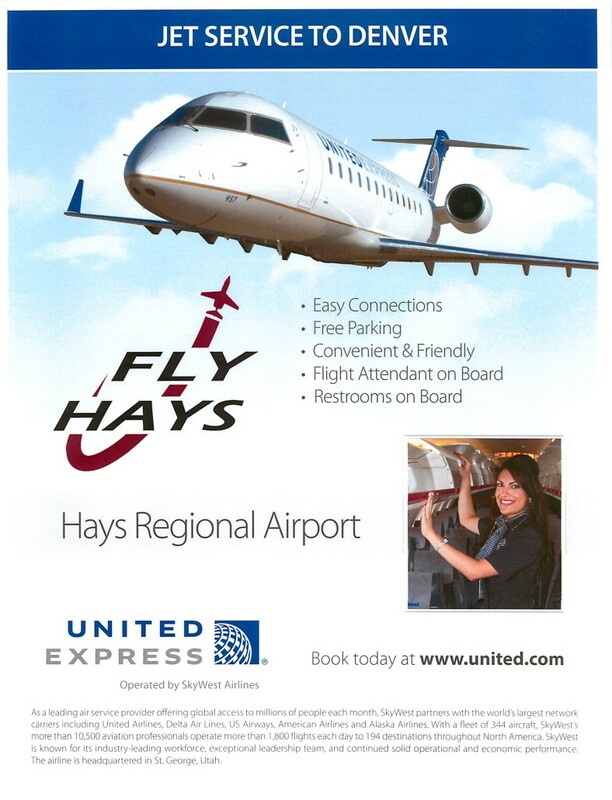 HAYS, Kan. April 21, 2014 – The first United Express flights, operated by SkyWest Airlines, from Hays to Denver are scheduled to take off beginning Aug. 1, 2014. These new daily flights make it possible for Hays travelers to easily and conveniently connect to United’s global network at the airline’s Denver hub. Each of the 12-weekly flights from Hays to Denver has been timed to provide maximum connection opportunities for both business and leisure travelers. Customers will also have the opportunity to accrue frequent flier miles in United’s MileagePlus loyalty program. And with 350 daily United and United Express flights from Denver, Hays travelers have access to destinations around the globe. The Hays flights will operate using 50-seat Bombardier-manufactured CRJ200 aircraft. These proven regional jets will provide each passenger with a quick, comfortable flight. About SkyWest Airlines: As a leading air service provider offering global access to millions of people each month, SkyWest partners with the world’s largest network carriers including United Airlines, Delta Air Lines, US Airways, American Airlines and Alaska Airlines. With a fleet of 336 aircraft, SkyWest’s more than 10,500 aviation professionals operate more than 1,700 flights each day to 181 destinations throughout North America. SkyWest is known for its industry-leading workforce, exceptional leadership team, and continued solid operational and economic performance. The airline is headquartered in St. George, Utah. Visit www.skywest.com for more information and follow @SkyWestAirlines on Twitter.